Join the Soroptomists who are participating in the "Dress a Girl Around the World" Campaign, an operation run under Hope 4 Women International (a 501 (c) 3 organization) bringing dignity to women around the world since 2006. Hope 4 Women International is a nondenominational independent organization. Visit our website to learn more at Hope 4 Women International. We dream of a world in which every girl has at least one new dress. We want girls to know that they are worthy and respected. People from all States, Canada, Uganda, the UK, Philippines, Australia, Sweden, Costa Rica, South Africa, Germany, Norway, Okinawa, Japan, and Hong Kong are making dresses. Together we really are dressing the girls around the world for Hope 4 Women International. 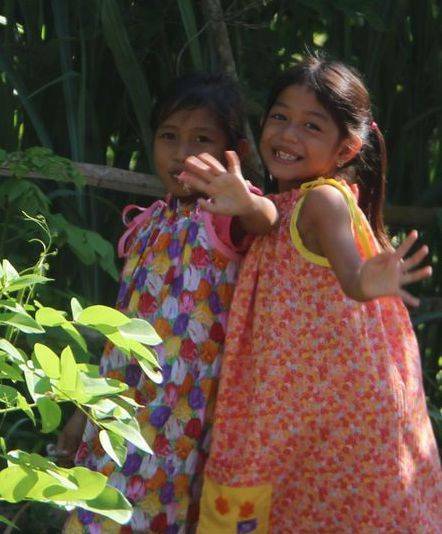 There are teams and partners distributing these dresses around the world. Join the Rocklin-Roseville area Soroptomist club in this day of giving, helping repaire and mend worn dresses to be shared with the "Dress A Girl Around The World" program. Basic sewing skills (household machines) are helpful, but everyone is welcome. We need people to help iron, snip and pin as well as sewing. 2019 © HackerLab Rocklin. All rights reserved.